Moon Geun-young will return to the television screen after five years, this time as a 'man'. Pan-Asian start Boa will sing the original soundtrack for a Japanese movie. Which Korean Stars Have the Greatest Pulling Power? Reporter: How were you cast in the movie "I Don't Need Love" ("Love Me Not")? View all 54 pictures for "Love Me Not"
story of love, sacrifice, and believing. Overall, this movie is worth watching with interesting flow of plot. 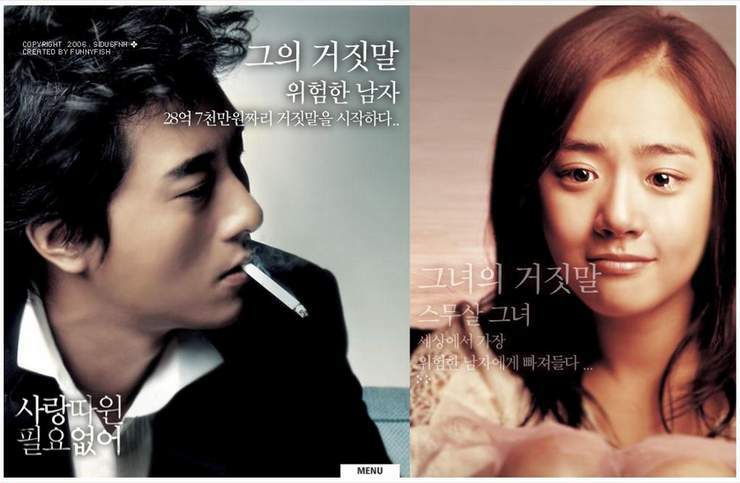 Since this is the third movie of Moon Geun Young I watch, I can see that she gets maturer being an actress. She plays so well, being a coldhearted woman who doesn't need love at all (at first). Watch another movie of her, which are My Little Bride and Innocent Steps. You'll find how good she is at playing various kinds of character. Also Kim Joo Hyeok is a great partner in this movie. Being so mischievous but then turns to be affectionate. They really give their 'heart-catching' performance. And yeah, surprisingly, the story ends happily. I like this movie. A nice way to depict love and sacrifice. Moon Geun Yeong plays so well. No doubt, her acting gets maturer. moon looks like audrey hepburn in the final scenes! It's a movie that reflects the reality of falling love, and taking risk in loving! I so love Moon geun young! Please see my video of Moon geun young at you tube. Does anyone know where I can find the song from MV. I was love it for the first time I listen to.